Here's another Bo Sanchez Event, How To Heal Yourself Naturally “Live” Seminar on February 28, 2015. You can read the details of this seminar below. Are You A Walking Time Bomb? Do you know what pains me more? I know that a lot of people appear healthy on the outside but are like “walking time bombs” on the inside. They appear “okay” as though everything is normal, but actually, cancer cells are already multiplying rapidly in their bodies. Or their bones are wasting away with osteoporosis. (And milk can make you worse, not better.) Or their blood vessels are almost blocked up. Or their colon is now covered with toxic gunk. When someone says, “My doctor discovered a cancerous tumor in my body…” that person thinks that the cancer just “popped out” on that day or that week or that month. Actually, it has been building up for MANY YEARS. Because that person—for decades—has been living a Cancer-Producing Lifestyle. This doesn’t have to happen to you. You can learn to live a Health-Producing Lifestyle instead. What Is The Root Cause Of 90% Of All Diseases? According to research, as much as 85% of our diseases today are LIFESTYLE diseases. What does that mean? We can cure them naturally. Here’s the good news: YOU can stop the ticking time bomb in your body. You can reverse the progress of the diseases by using the natural power of your body to heal itself. Stop Making Your Body A Garbage Dump! Step One: Reject all incoming garbage. I can teach you how to do this. I’ll share with you “8 Simple Shifts” that will turn the direction of your body around. Instead of walking towards terminal disease, your body makes an about face, and starts walking towards vibrant health. Step Two: Cleanse your inner body from decades-long garbage that has accumulated EVERYDAY. Listen to my logic. Do you take a shower everyday? If you bath your outer body daily, you should also bath your inner body daily as well. I can teach you how to do this too. If you do this cleansing habit that I will teach you, it will change the direction of your health. But alas, people don’t know about this natural, God-given power inside their bodies. Because people don’t know how to heal themselves naturally, they turn to expensive drugs and expensive medical treatments to heal themselves. But not only do most of these drugs and treatments have side effects, they don’t address the real cause of their disease. Do you know that many of the popular pills that we take, such as for pain-relief or for headaches or for fever, affect our liver—the only organ in our body that’s able to clean up our blood from toxic build-up—the very cause of our diseases? What you thought heals actually worsens your condition over time. Most expensive drugs and medical treatments are short-term solutions. They’re band aids. They don’t heal you. But they’re “marketed” as such. So they lull you into thinking your problem is solved, when actually, it was just covered up. So what if you get a heart-bypass that costs half a million pesos? If you don’t heal the root cause of why you had that blockage in your blood vessels in the first place, you’ll need another bypass very soon. So what if you get 6 sessions of painful chemotherapy? If you don’t heal the root cause of why you had cancer, cancer will return with vengeance, and very soon, you’ll need a stronger dose of chemo again. In an informal survey among Oncologists (Doctors specializing in cancer), they were asked, “If you had cancer, would you go through chemotherapy?” Shockingly, 91% of them said NO. But 75% of cancer patients go through chemotherapy today. Do you see a conflict here? People think cancer IS the tumor. Nope. The tumor is like the tip of the iceberg. Cutting the tumor away via surgery doesn’t mean the cancer is gone. If you want to remove the cancer, you have to go deeper. But it’s so deep, there is no scalpel on planet earth that can reach it. What can reach it? What can truly cut it away? Only your own body’s healing power can reach to that depth. My daily frustration? I know there are so many people who are getting sick USELESSLY. They could have avoided so much pain, disease, and early death, if they just healed themselves naturally. I believe in NATURAL healing. You can heal yourself without (or with minimal) use of drugs and modern medical treatments. You can be healed by using powerful emotional, spiritual, and nutritional healing processes. I’m excited. On February 28, I’ll be giving a Seminar on How To Heal Yourself Naturally in Mandaluyong City. I want you to be there. I want to teach you how to awaken the healer in you. How to lose weight PERMANENTLY; Learn how to ideally stay slightly underweight—to remove the stress of your body from carrying the extra load 24 hours a day. My life-changing 8 Simple Shifts To Vibrant Health Program—because health isn’t about the absence of disease; I’ll teach you how to create a body that is vibrant, strong, and alive, ready to serve humanity and bless the world! Learn how to elevate your immune system to super optimal level; You’ll be so strong, germs that cause more “common” diseases that plague almost everyone—common colds, coughs, flu—will rarely have an effect on your body. Discover the 6 Power Principles on how to “Awaken The Healer In You”—uniting the natural powers of your body, soul, and spirit—to heal yourself. Learn the “healing” foods that you need to eat everyday. Be inspired to hear my Health Mentor’s stories of other people he has helped through healing and recovery. Discover alternative healing modalities that have been practiced for thousands of years—and find out if they’re for you. Over your entire lifetime, how much have you spent for your medicines and medical treatment? Invest in your health instead. Learn how to heal yourself naturally. Most important, learn how to prevent disease by building a “force field of health” around you. 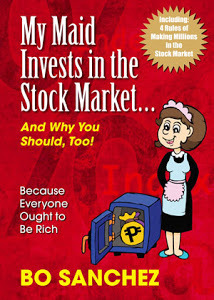 To join my How To Heal Yourself Naturally Seminar, your learning investment is P1475 only. But if you sign up before January 28, you get it at the early bird price of P975 ONLY! I know that’s a steal, so grab it now before we run out of seats. You can also avail of VIP Tickets--and we'll reserve front seats for you, so you can listen to the material with total focus. If you get a VIP Ticket, you also get a free autographed copy of my book, Awaken The Healer In You. PS. Change Your Health, Change Your Life. Imagine yourself 5 years from now. How healthy do you want to be? Join me in this How To Heal Yourself Naturally Seminar and enjoy vibrant health. For more information, sign up by emailing Mean at beaconlightevents+seminar@gmail.com.com now. She’ll email you an application form. PPS. Interested in Stock investing in the Philippines?